Posted on September 24, 2011 January 16, 2017 CategoriesSpeaking & PresentationTagsdistractions, Grabbing Audience Attention, too much informationLeave a comment on Got Their Attention ? Check out this great presentation on distraction in the workplace from Harmonie – a company to watch. Remember that “Less is More” for everything -number of presentations, time spent presenting and slides. Make sure every slide is really needed or delete it. 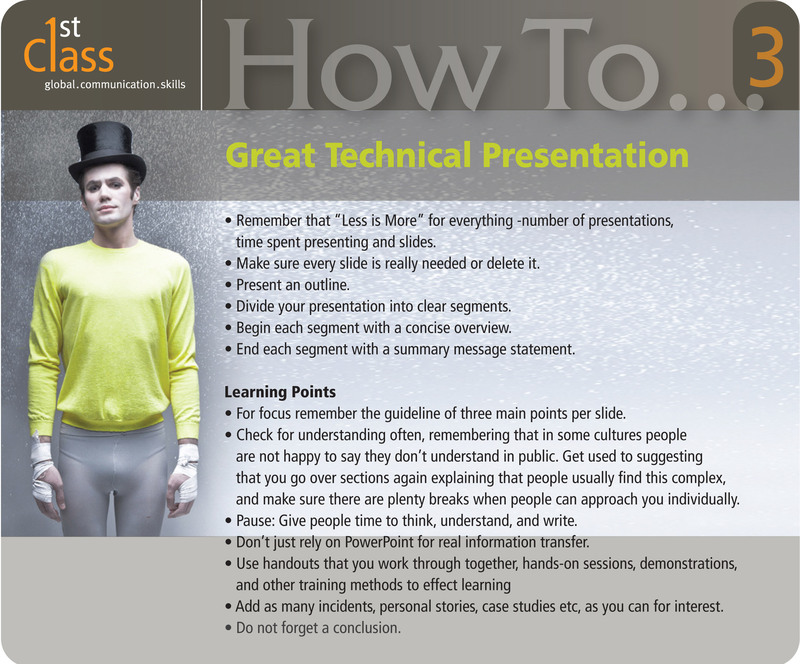 Divide your presentation into clear segments. Begin each segment with a concise overview. End each segment with a summary message statement. For focus remember the guideline of three main points per slide. Check for understanding often, remembering that in some cultures people are not happy to say they don’t understand in public. Get used to suggesting that you go over sections again explaining that people usually find this complex, and make sure there are plenty breaks when people can approach you individually. Pause: Give people time to think, understand, and write. Don’t just rely on PowerPoint for real information transfer. Add as many incidents, personal stories, case studies etc, as you can for interest. Do not forget a conclusion. Personality, stories and authenticity. These are some of the watchwords for what works in speaking now. Gone are the days of corporate blah blah. Have a look at an early example by the late, great Steve Jobs. A really good PowerPoint presentation is a hard thing to find. Make sure that your slides are not overloaded with information. Make sure they are readable – font size and right colour. Reduce the amount of text on your slides. 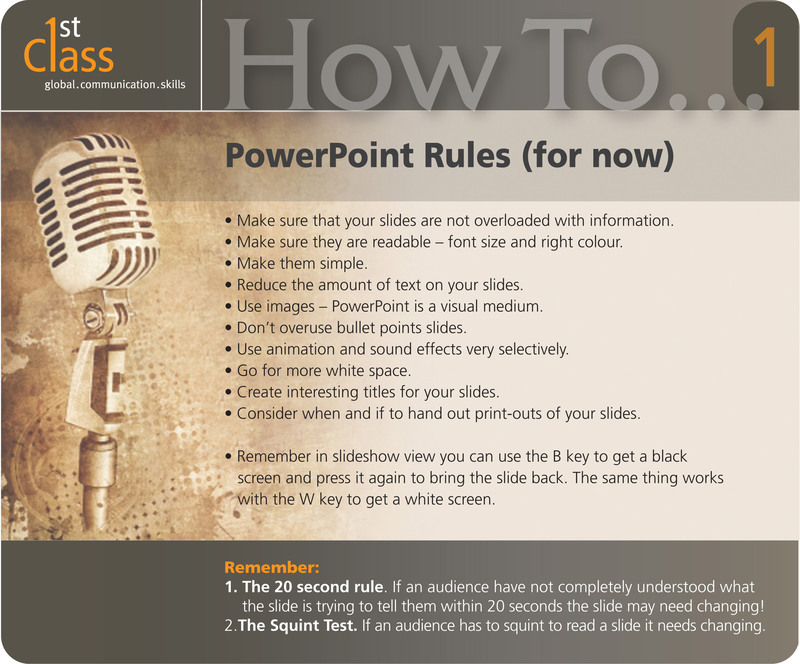 Use images – PowerPoint is a visual medium. Don’t overuse bullet points slides. Use animation and sound effects very selectively. Go for more white space. Create interesting titles for your slides. Consider when and if to hand out print-outs of your slides. to get a white screen. 1. The 20 second rule. If an audience have not completely understood what the slide is trying to tell them within 20 seconds the slide may need changing! If an audience has to squint to read a slide it needs changing. Preparing for questions should be an integral part of preparing the content of your communication preparation. It follows on from the question “What’s on the audience’s minds?”. In preparing answers for the more difficult questions that you may be asked start from a point of sincerity. In an era of informed audiences only open and honest communication will be successful. Despite that, some the strategy you choose depends on the situation, the style of questions (friendly, neutral, hostile) and the image you want to convey. You should know all of these techniques so that you can vary your answering style . In meetings, feed back the question to the audience and let them decide amongst themselves. Agree and say that the question will be passed on to the right people. Say that you will check or get an answer from the right person and do that. This is a list of techniques so you can add interest to your in your one-to many communication. Try sprinkling them throughout your presentations. You should aim for at least one every 2 – 3 minutes.